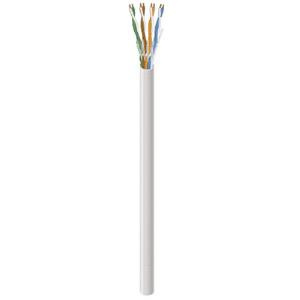 Southwire 23/4P Riser rated CMR Cat 6e cable with 0.24-Inch OD, features blue colored PVC jacket to withstand daily wear and tear. The bare copper cable has FRPE insulation that resists electrical leakage and offers protection against environmental threats. Cable has operating frequency rating of 550-Mega-Hz. It has operating temperature rating of 75 deg C. It is ideal for 1000 Base-T Gigabit Ethernet, 100 Base-T Fast Ethernet, 10 Base-T IEEE 802.3 and 4/16 Mbps token ring applications. This 1000-ft cable comes in a Reelex™ box. Cable is UL/cUL/ETL and meets ANSI/TIA/ISO/IEC standards.